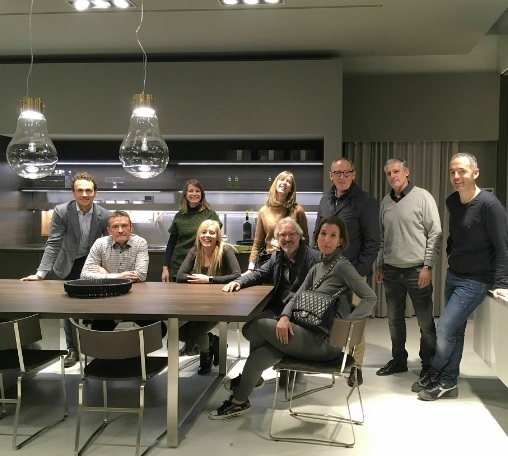 Last February we had the pleasure of living the great architectural experience of Arclinea: the Architour, with some professional colleagues on a trip to Italy where we could enter into Italian architecture and its origins. We lived the carnival of Venice and its spectacular basilica of San Marco, the beauty of the city of Vicenza and the Piazza dei Signori, the Palladian Basilica and the Bissara Tower. We also visited the Arclinea Headquarters and its factory in the town of Caldogno, in Veneto, where we contemplate their current collections and the craftsmanship in the construction by a hand of their shooters. The Architour Experience is all thanks to the great team of Arclinea Kitchens. We ended the visit with a Showcooking in the showroom Arclinea Vicenza accompanied by Federico Fortuna, a descendant of the founding family of Arclinea. Finally, we enjoyed the architecture of Verona and the Arclinea’s showroom in Milan, ending an incredible 3-day trip full of professional and personal enrichment. If you want to know more, you should check our social media accounts on Instagram, Facebook and on Twitter, where we will upload all the information we have. However, in case you are looking to know more about our interior design projects you can do it on our website. And do not hesitate in contacting us in case you need any help.